Though Whiplash was first released in Australia late last year, its Oscar nomination means that it’s receiving an (ahem) encore performance in cinemas at the moment. I’m glad I took advantage of this reprise to catch up with Damien Chazelle’s intense psychological drama. J.K. Simmons plays Fletcher as a man who can only teach through negative reinforcement. He screams, throws things at his students, abuses them physically and verbally. Simmons’ performance has quite rightly been nominated for an Academy Award, and he gives 250% in Whiplash. Which is, appropriately I suppose, also how much Fletcher demands from his musicians. Teller is similarly excellent. The actor’s star is clearly on the rise, since he is a part of both the Divergent and new Fantastic Four franchises, so we’ll be seeing a lot of him in the coming years. Paul Reiser, whom I haven’t seen on the big screen in over a decade, is great in a small role here also. Director Chazelle is clearly incredibly talented. The scenes crackle with wondrous intensity, and are edited to perfection. It’s little wonder that editor Tom Cross is also up for a gong. Whiplash is a bold piece of work. It isn’t particularly original – 2006’s Four Minutes (Vier Minuten) told a similar story – but this is a true edge-of-your-seat experience. It’s also a bit like watching an 107 minute car crash. And yet you can’t seem to tear your eyes away. To those of you thinking that this was a spin-off from Iron Man 2, featuring Mickey Rourke’s bird-loving Russian scientist, I apologise (seriously, if you’ve made it this far through the review under that misapprehension, you’re not paying attention.) 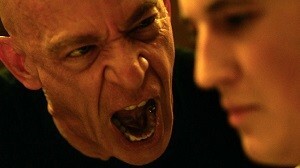 Whiplash is a brutal, highly strung drama featuring some fantastic performances. It’s also a frustrating experience. The narrative didn’t go where I wanted it to go, but I can’t hold that against the filmmakers.